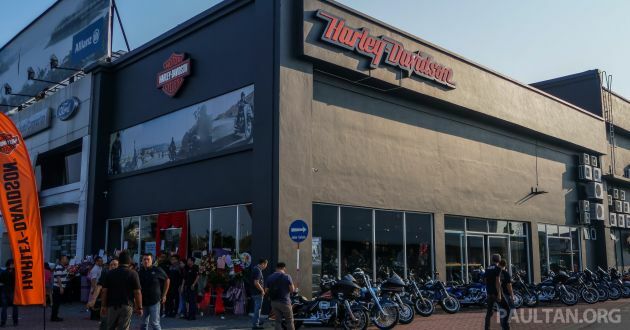 In line with its expansion plans, Harley-Davidson Malaysia has opened a third branch, this time in Penang, joining its branch in Malacca and its flagship centre in Petaling Jaya. Located in Auto City, Bukit Tengah Prai, the new Harley-Davidson Pulau Pinang is a RM6 million investment and is operated by GB Motorcycles. Aside from the showroom and sales of the latest models from the iconic American motorcycle brand, Harley-Davidson Pulau Pinang also acts as a one-stop centre. Here, Harley riders can obtain servicing and repairs for their bikes, along with spare parts, accessories, riding gear and other Harley-Davidson lifestyle products. During the opening, Harley-Davidson Malaysian also officially announced pricing for its CKD motorcycle models, which come from Thailand – five Sportster models and seven Softail models, where prices were compared to the CBU bikes. With pricing starting from RM62,600, you can find a complete breakdown of Harley-Davidson Malaysia pricing here. Celebration of the opening was enlivened with the presentation of brand new Harleys to two owners in the northern region. They were joined by Harley-Davidson riders and owners from across Malaysia. “For us, the official Harley-Davidson dealer representative is very important because they are are in offering the complete Harley-Davidson motorcycle experience,” said Johan Kleinstuber, managing director of Harley-Davidson Asia Emerging Markets. The post Harley-Davidson Malaysia opens Penang showroom appeared first on Paul Tan's Automotive News. 0 Response to "Harley-Davidson Malaysia opens Penang showroom"